Award winning 'Nakiska' one of Port Moody's finest buildings. Gorgeous suite with a private greenbelt setting features 9' ceilings with crown mouldings, large spacious rooms, hardwood & tile flooring, insuite laundry/storage room, ope n floor plan with superb layout. Large master has walk-in closet & 4 piece en-suite bathroom; closets featuring organizers. 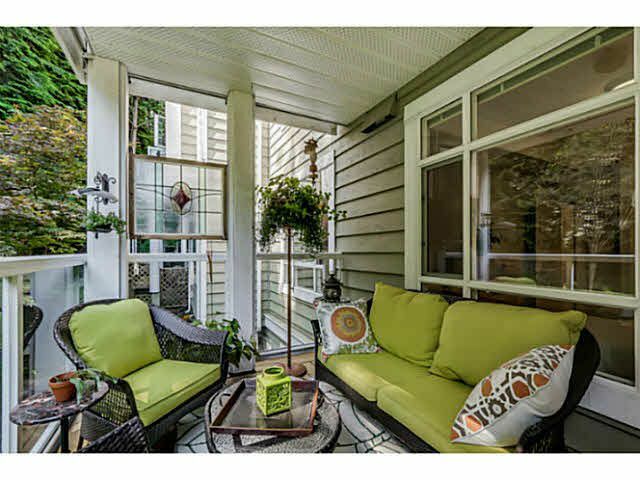 This unit also offers huge private covered private deck. Building has amenity room for parties or just a game of pool. 1 parking & 1 storage also included. Close to W/C Express & new Skytrain, minutes to Rocky Point, Newport or Suterbrook Villages, shops, easy access to downtown as well. Building in great shape too. Don't miss this pristine unit & private tranquil setting.